There’s no place like home, right? Whether your Hinsdale-area starter home turned into your forever home, or you’ve recently purchased a new house near Naperville or in the surrounding suburbs, the idea of living in place for as long as possible is appealing to many people. As you get older though, your current floor plan or layout may not work for you. Perhaps you can’t climb as many stairs as you once could, or you now need wheelchair access or an open concept to help you get around better. The good news is that there are a lot of modifications available with senior home renovations that will allow you to continue living in place and to enjoy the comforts of your own home. LaMantia has completed several aging in place remodeling projects to improve the functionality of homes and make it easier for older adults to live comfortably. For example, for one client, our team converted a three-bedroom ranch into a two-bedroom home. The sizes of the bathroom and the kitchen were increased, and the laundry was moved from the basement to the main level. Widen Doorways and/or Hallways: Standard doorways are 30 inches wide, but that doesn’t accommodate walkers or wheelchairs. Narrow hallways can also make moving around your home difficult. By increasing the width of doorways and hallways, you’ll be able to maneuver around your home with ease. Create an Accessible Kitchen: Countertops can be raised or lowered, depending on whether you’ll be sitting or standing while preparing food. Roll-out shelves make it easier to get what you need, or you can opt for open shelving rather than traditional cabinets. You could include a custom island with room for seating to help you avoid bending over while you work. Include a Ramp Entrance: If you use a wheelchair, getting into your house may be a challenge. With an exterior renovation, your home can be remodeled to include a ramp up to your front or back door. Make Your Bathroom Accessible: Aging in place bathroom remodeling projects are some of the most common. If your current bathroom no longer meets your needs or doesn’t provide the safety you require, you can make it accessible. 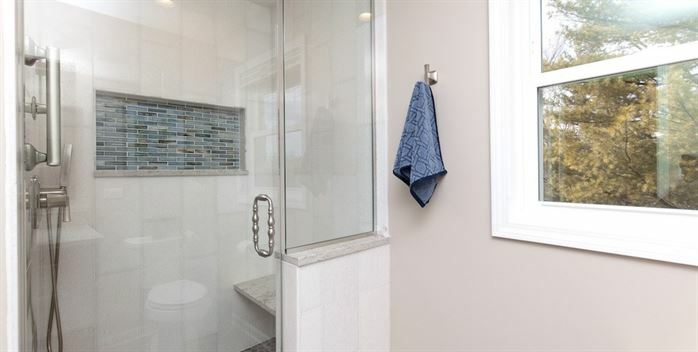 Swap out the tub for a walk-in shower with a seat or install a tub with a shorter side wall. Include handrails and grab bars in the shower and near the toilet for assistance, and get a taller toilet if you have trouble sitting and standing. Update the Flooring: As part of your senior home renovations, you might be want to install floors that make it easier to walk around. If your home is currently carpeted, it can be tough to maneuver a wheelchair or walker, so you might want to consider hardwood, laminate, or tile. Consider Smart Home Features: There are many technological advances for homes these days, and they can help you remain independent while living at home. Smart speakers allow you to control lights, locks, TVs, and more, and you can even call for help via the speaker if you’re in need. Smart thermostats allow you to better control the temperature of your house (and they can help lower your utility bills as well), and there are fridges that can keep track of what groceries you need.